The widescreen image of the small building on an island in a canyon with a ringed planet and blue sky....where is that from? It's from the ninth episode of the first season of Star Trek: The Original Series, entitled Dagger of the Mind. You can see the shot in this comparison of the old and new VFX. 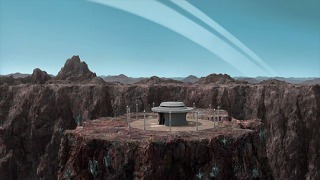 The digital matte painting was created by visual effects artist Maximilian Gabl as part of his work on the remastered versions. Is there a canon in the Star Trek universe?